When I began writing about a school field trip to the Hermitage, little did I suspect it would turn into a series of columns about Andrew Jackson. With apologies to those who are weary of the subject, here’s the third and final (I promise!) installment. Unless you’ve been living under a rock for the past several months, you no doubt know that a move is afoot to take Jackson’s picture off the twenty dollar bill and replace it with the picture of a woman. There are a number of reasons why some folks think such a move is long overdue, the first being that no woman has ever been featured on folding money in the United States. But there are other arguments for replacing Jackson. Students of history point out that our seventh President would likely be outraged that he’s on the twenty in the first place, since he was a gold-and-silver man who hated paper currency. Others say that, because Jackson was a slaveholder and an Indian foe, he ought not to be riding around in people’s wallets. They point out that some members of the Cherokee nation hate Jackson so much that they refuse to handle a twenty dollar bill because his picture is on it. So what would it take to get him removed? Certainly not an act of Congress. Apparently, the Secretary of the Treasury—a position currently held by a man named Jack Lew— simply needs to believe that a change is appropriate. 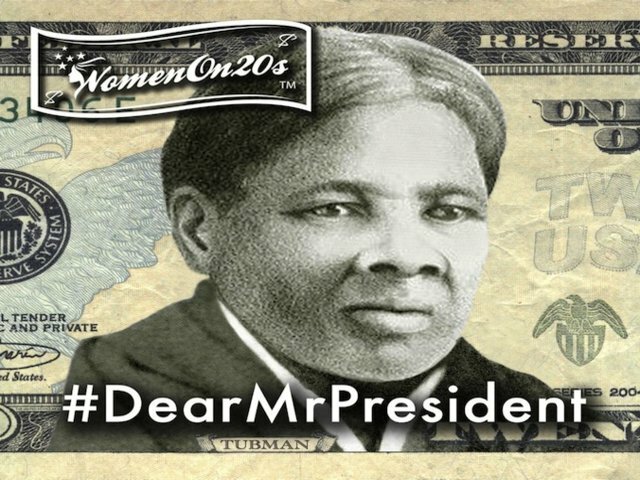 A group of activists called “Women on 20s” came up with a list of dead women (being deceased is the only requirement for having one’s picture on money) whom they thought deserved consideration. Then they put the matter to an online vote. Over a period of ten weeks, more than 600,000 people cast votes as to which woman should replace Jackson. The top four vote getters—Eleanor Roosevelt, Harriet Tubman, Rosa Parks and Wilma Mankiller— then faced each other in a run-off. Which does not mean government printing presses will immediately start cranking out new twenties with her face on them. Should interested citizens be able to persuade President Obama that this change is a good idea, he’ll pass the word on to Jack Lew. Proponents hope the Tubman twenties will be circulating by 2020, when the one hundredth anniversary of the woman’s suffrage amendment will be observed. Which would be very, very cool. So who is Harriet Tubman, anyway? Those who remember their U.S. history know that Harriet Tubman was considered by many to be the Moses of her time. She was an escaped slave who, in the 1850s, became one of this nation’s leading abolitionists. Tubman returned to her native South more than a dozen times to rescue family members and others from enslavement. She served as a “conductor” on the Underground Railroad, an elaborate secret network of safe houses leading to freedom up north. Because of her vast knowledge of the geography and transportation systems of the south, Harriet Tubman became an invaluable asset to the Union army, serving as a scout and spy as well as nurse and cook, during the Civil War. In 1863, she led an armed raid that freed 700 slaves in South Carolina. Years later, she campaigned with Susan B. Anthony to gain the vote for women. Do those actions make her worthy of replacing Old Hickory, who himself replaced Grover Cleveland on the twenty dollar bill in 1928? I believe they do. And so I will join with thousands of others urging President Obama and Jack Lew to support this change. If you’d like to be part of the movement, too, you may visit www.womenon20s.com.